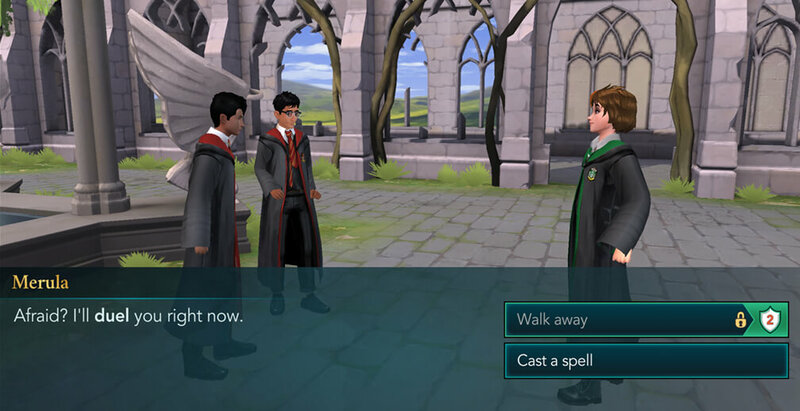 Hello everyone, it is time for Chapter Three of Year One of our Magical Journey Walkthrough for Harry Potter: Hogwarts Mystery. In the previous Chapter, we arrived at Hogwarts School of Witchcraft and Wizardry and got sorted into a House. We checked our Common Room out and got familiar with our new home. Afterward, we attended our first Charms class in which we learned the Wand-Lighting Charm – Lumos. Next, we had a Potions class with Professor Snape, where we learned to brew Cure for Boils. 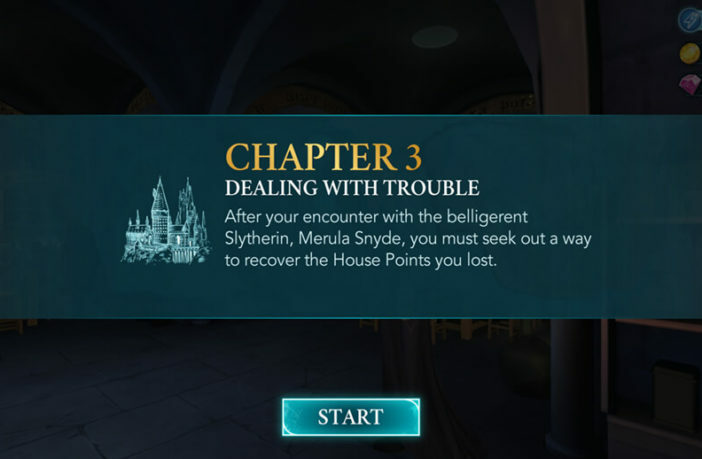 However, thanks to Merula Snyde’s sabotage, we got punished and lost ten House Points. Now is the time to report to our Prefect and explain the situation. Tap on the GO button to proceed to your Common Room. On the way there, you will encounter another first-year student. His name is Ben Copper. 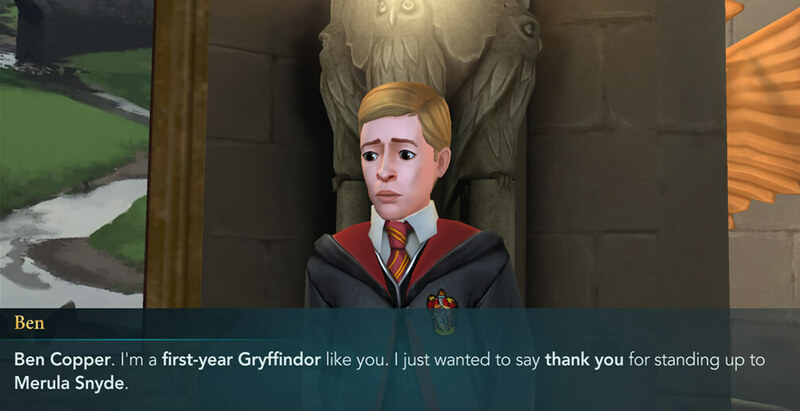 You’ll find out that he is from Gryffindor house, and he’ll thank you for standing up to Merula. 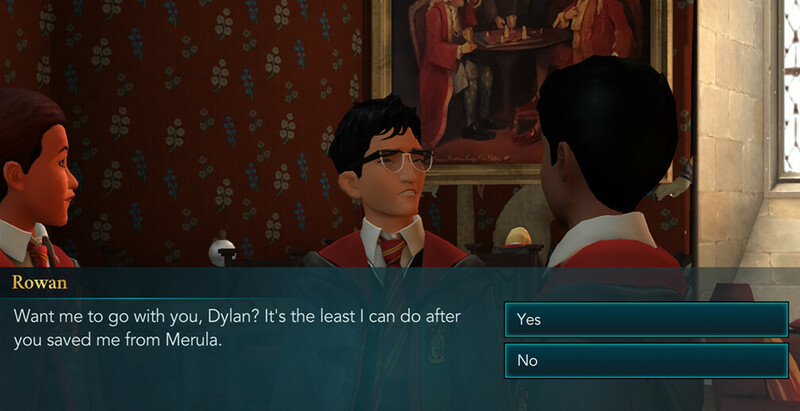 After some talking, you’ll find out that he got bullied by Merula a lot because he is from a Muggle family. That is one of the reasons he is always afraid of things. After you’re done with the conversation, proceed to your Common Room. 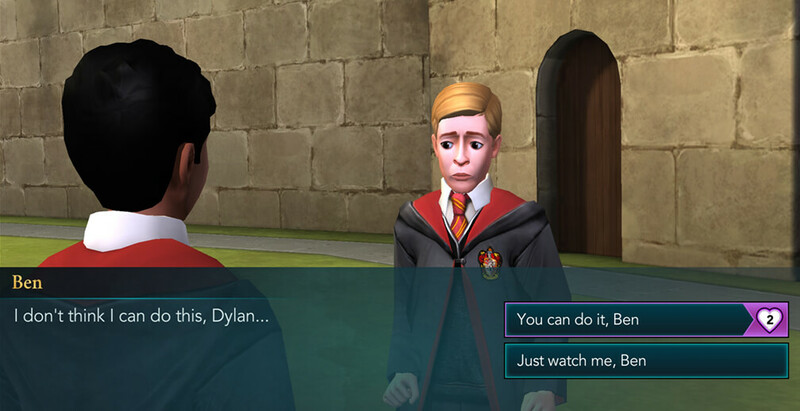 You’ll meet your Prefect for the first time. You’ll have the chance to explain yourself and earn some attribute points in the process. 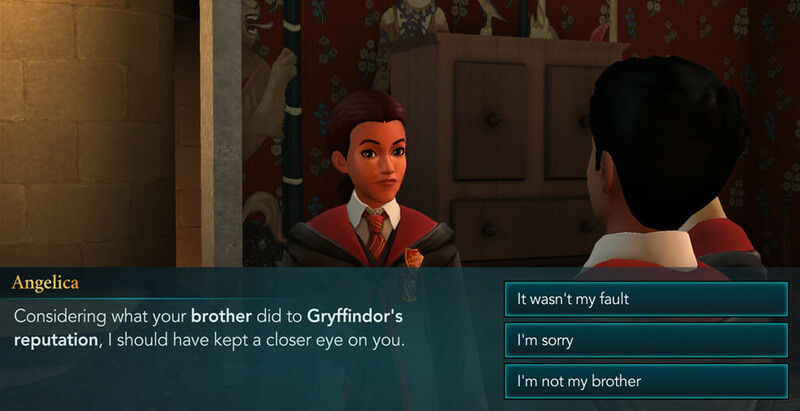 Choose one of the options to respond with when she mentions your brother. She will then show you a letter sent by Professor Snape. In the letter, he will say he came to a conclusion that your potion might have been tampered with. He’ll ask you to bring him a jar of Pickled Slugs from the Potions Storeroom if you want to restore the house points you lost. Rowan will immediately offer to go with you, so you have the option to let your friend tag along. Your Prefect will be delighted to hear that you have a way to restore the House Points and will suggest you get that Jar for Professor Snape immediately. So, hit that GO button and proceed to the Potions Storeroom. If you decided to let Rowan join you, he’ll wait at the storeroom door. Something will seem odd to him since he doesn’t think this is the correct location. In any case, upon entering, you be completely surrounded by darkness and will notice that the door behind you is locked. You have to cast the Wand-Lighting Charm to illuminate your surroundings in order to see anything. 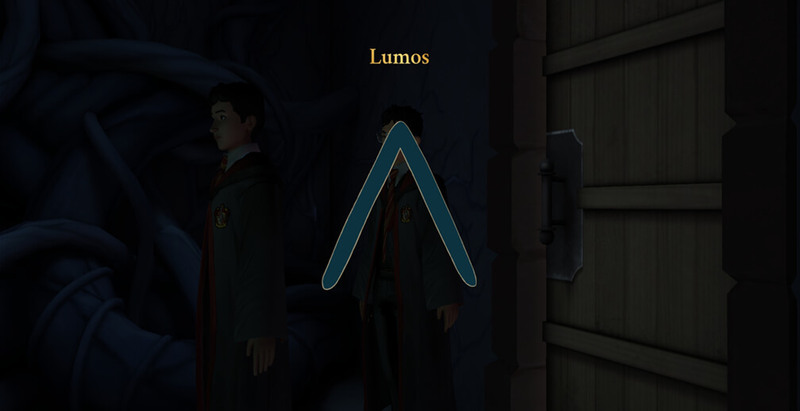 Trace the path on the screen to successfully cast Lumos. Once you do that, your wand will shine some light around and you’ll realize that this definitely isn’t a potions storeroom. There is also a huge plant-like creature in the room. 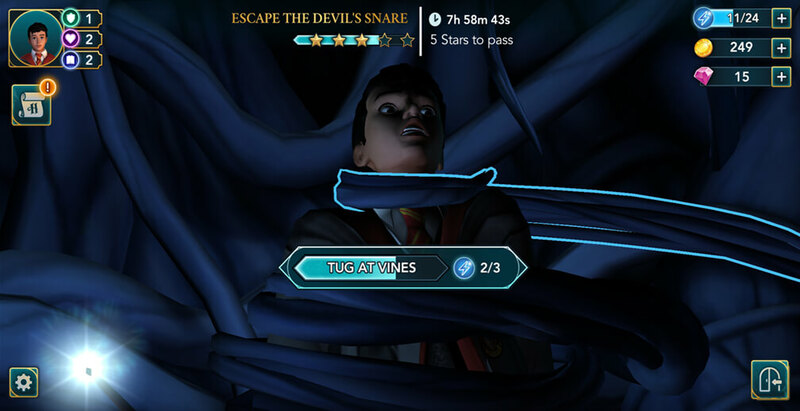 You’ll then hear Merula speaking from the other side of the door, and you’ll find out that this was all a trap set by her, and the creature in the room is the Devil’s Snare. Since you have to get out, the best plan you can devise would be to repel the Devil’s Snare while Rowan calls out for help. This task requires you to earn Five Stars within one hour, so when you’re ready, hit the Start button to begin. To escape, you have to complete actions by tapping on glowing objects in order to fill up the Star Meter. 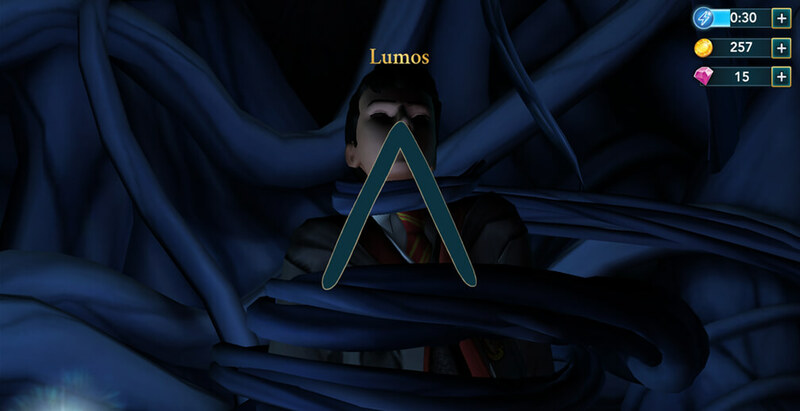 Occasionally, you’ll have to cast Lumos charm to repel the Devil’s Snare. As usual, you can do so by tracing the path on the screen. Once you obtain all five stars, hit the Collect button to continue. You will hear a voice on the other side of the door. After a bit, the door will open and you will see a familiar face – Rubeus Hagrid. He heard you in that room and decided to see what’s going on. It won’t take him long to recognize you and start a conversation. You’ll explain the situation to him, and he’ll ask what are you planning to do regarding the matter. You have three options to respond with. Each of these choices will earn you some attribute points, so choose the option you prefer the most. 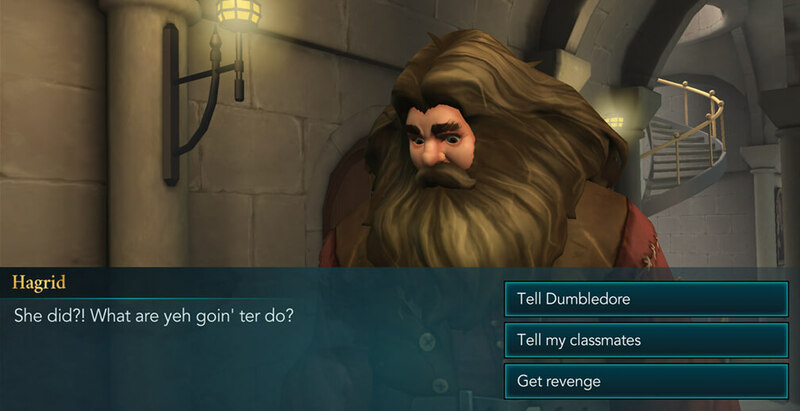 Regardless of your choice, Hagrid will advise you to think things through before you act. 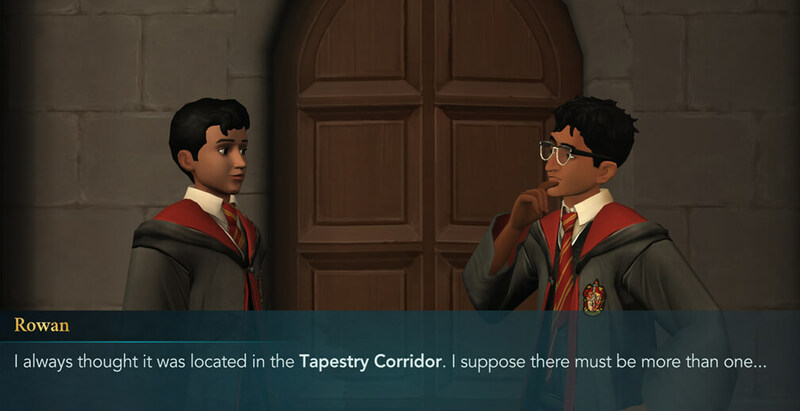 He’ll also suggest you go back to your Common Room and find something else to wear since your robes are pretty torn up. 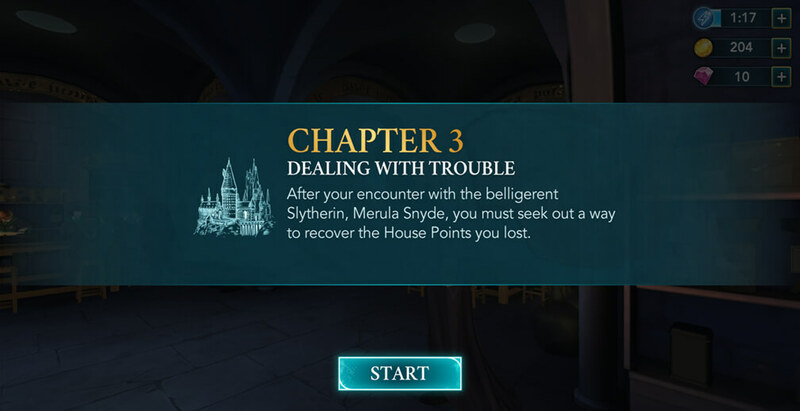 So, the next task is to get back to your Common Room and report to your Prefect. When you get there, she will look at you confused. After you explain the whole situation to her, she’ll suggest you change your outfit. This will open up the Cosmetic menu where you can make various changes to your character’s appearance. Some of the customization options require a certain level to unlock, so for now, you can choose the ones available to you. 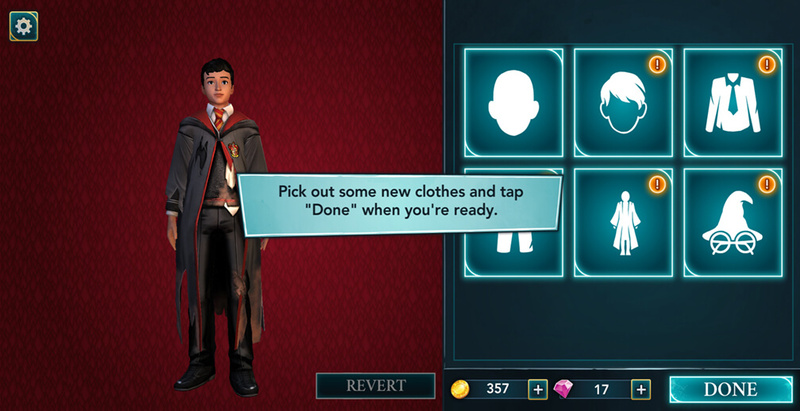 Once you’re done changing, your Prefect will send you to your first Flying Class. Hit the GO button and proceed to the Training Grounds. When you get there, tap on the exclamation mark to begin. Madam Hooch will introduce herself and explain some of the basics. After that, Ben Copper will tell you he is very afraid of flying. You have two options, you can either encourage him or tell him to watch you perform. The first option will require you to have level two in Empathy attribute. Each option will award you some attribute points, but in general, options that require specific attribute level will give you more points. Anyway, tap on the exclamation mark to begin this lesson. You will need to earn two stars within one hour to pass. So, like in other classes, complete actions by tapping on various objects to fill up the Star Meter. There is, however, one small addition now. 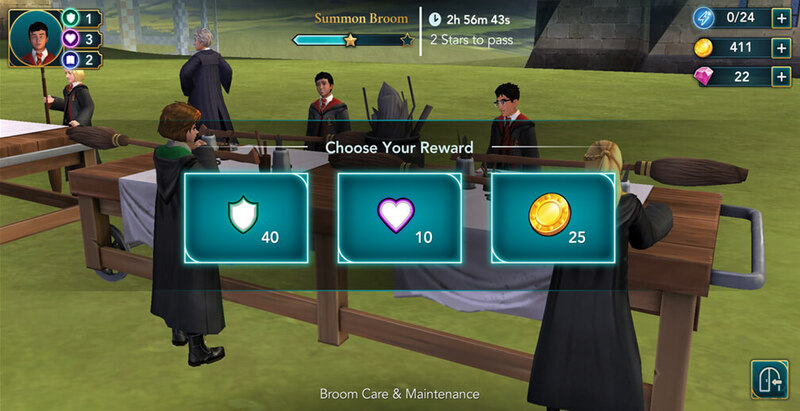 From this point on, every time you earn a star, you will be able to choose one of three possible rewards. Those are mostly random, but you can get from 5 to 40 attribute points for a single attribute, you can get from 25 to 1000 gold coins, and in some rare cases, you’ll be offered energy or gems. We strongly suggest you pick attribute points in almost all cases unless you’re offered something like 1000 gold. When taking attributes, always select the one with the most points offered. Also, after you take a reward, you will be given a mini-task. If you successfully complete it, you will be given ten attribute points. 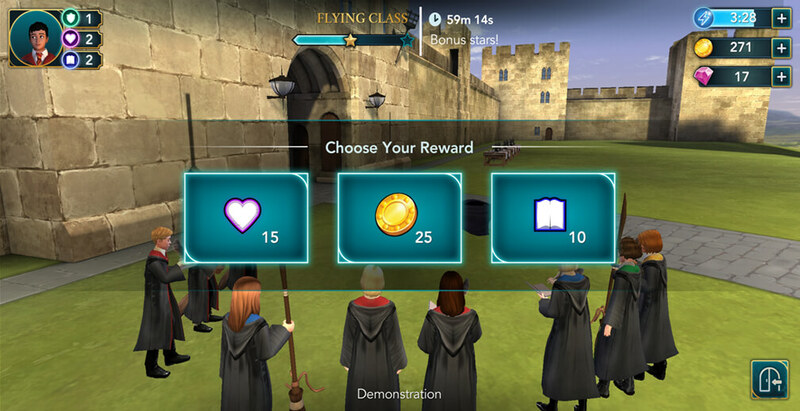 Flying classes will give you Courage, Potions will give you Knowledge and Charms will award Empathy attribute for completing mini-tasks. When you complete this class, you will unlock Summon Broom lesson. 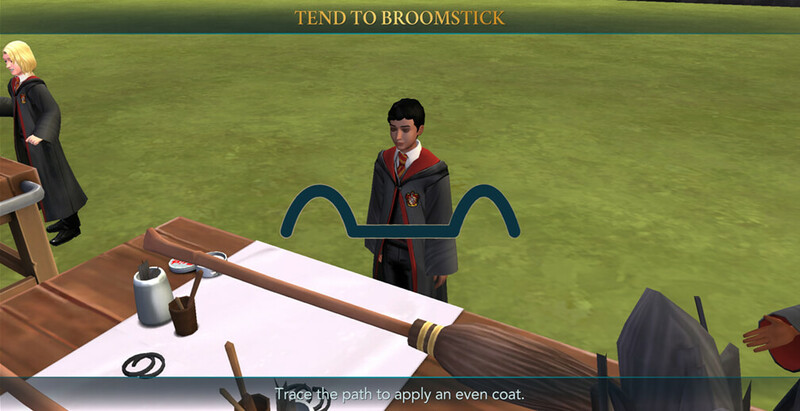 Ben will thank you for helping him and Madam Hooch will notice this and award you with ten House Points. 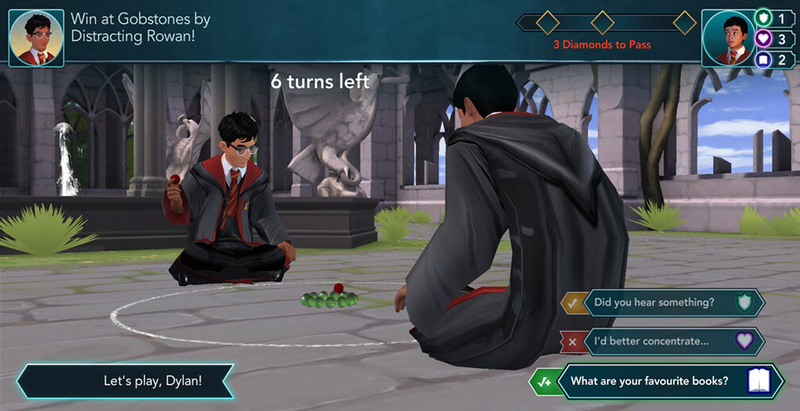 Your next task is to meet with Rowan to play some Gobstones. You can read more detailed information on that mini-game HERE. 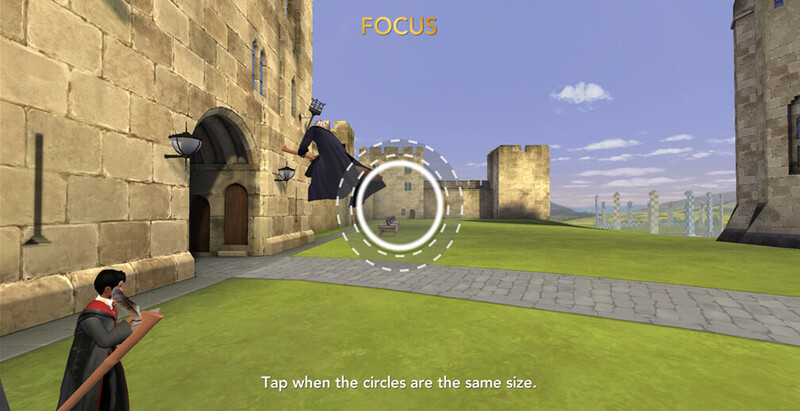 For now, tap on the GO button and proceed to the Clocktower Courtyard. Once you get there, Rowan will explain the basic rules. To win the game, you’ll need to distract him. The way to accomplish this is to choose the option that he’ll find most interesting. This will fill the Diamond Meter. You need to get three Diamonds to win. Also, each of the options is tied to a certain attribute, and having that attribute at a high level will fill up more of the Diamond Meter. When you’re done, you’ll notice Merula approaching. She will throw some insults your way and accuse your brother of working for The Dark Lord. You have three response options. Two of those will require level two in Knowledge and Empathy respectively but will award you with more attribute points. After a bit more talking she’ll challenge you to a duel. You have two options – if your Courage attribute is level two, you can choose to walk away, otherwise, your only option is to cast a spell. In any case, you don’t possess any dueling spell yet, so, she will simply cast Flipendo charm and make you fall on the ground. After she leaves, you’ll realize that in order to defend yourself, you need to learn how to duel. Your next task is to attend Flying Class and learn how to Summon Broom. Hit the GO button and proceed to the Training Grounds. When you get there, tap on the exclamation mark to begin. This lesson will require you to earn two stars within three hours. You’ll notice that in this lesson, Star Meter fills up much slower than before, so it is advised to start it with full energy. However, since you have three hours to complete it, it shouldn’t be too difficult to accomplish. Select a reward every time you earn a star and give your best to complete mini-tasks in order to earn some additional Courage points. After you finish this lesson, you’ll be rewarded with +1 Energy Limit which is a nice thing to have. This will conclude the third Chapter of our adventure. What were your favorite story moments in this one? What choices did you make? Let us know in the comments. Thank you for reading and see you soon with the continuation of our Magical Journey!